I committed a polish sin. I used the Nars Thakoon Collection for water marbling. But, please don't punish me just yet. I have a very good excuse for doing so. I find Nars rather expensive so I decided I'd collect slowly by buying a bottle a month. But I never got to do it because nanay (English: mother) bought 4 bottles for me as a birthday present. I was overwhelmed when nanay handed me the paper bag that contained those bottles. I didn't know what color to wear first so I decided to wear all 4 shades simultaneously. I needed an idea for the 5th color and using another brand was a no-no for me. I decided to create an accent nail that would showcase all the 4 colors that I had. I was juggling with a few nail design ideas when I decided to do water marbling. This is when I knew I'd be committing a polish sin because marbling can use up a lot of polish. But I figured the idea was forgivable since I'd only be doing 2 accent nails. Nars Rotin Jot is a light purple shade. Application was good and I reached full opacity with 2 coats. I used 3 thin coats of Nars Amchoor for complete coverage. Application was streaky as most yellows that I have. Regardless, I love how it finishes to a golden yellow hue. Oh, this polish is quite pigmented. Applying 2 layers of base coat is helpful to avoid stains. As for Nars Koliary, a cyan blue shade, 2 coats is enough for full opacity. Again, a highly pigmented polish. Be careful during application so as not to stain your cuticles and skin. Finally, Nars Anardana is a dark pink color. Can be a one coater. I used 2 coats. Application was a breeze. I'd probably get Lal Mirchi and Kutki just to complete the collection. The former is a bright orange shade and the latter is a light blue color. I think water marbling is a good accent nail when you want to wear a skittles manicure like this to bring all the colors that you used together. It actually came as a surprise that the Nars Thakoon polishes were very workable for marbling! Probably because they are very pigmented. And I know that you'll agree with me that the colors really look well together. I'm happy with how this turned out and I'm enjoying the last days of summer season here in the Philippines wearing this manicure. It's starting to rain and I just don't like the rain. It makes me feel gloomy. I love the water marble! Those colours are perfect for it. I don't really know why people would be shocked. I think it's beautiful. I love the water marble to pull the colors together and yours is spectacular! Any suggestions? I haven't tried water marbling yet but it's on my list to do soon. Did you use a base color under the marbling? wow very nice.. I should try marbling too but I'm not confident yet.. yikes! Very beautiful colors Rins, and the marling brings them so nicely together. I'm surprised to hear that Nars polishes can stain, I only experienced that with cheaper brands, nice info to have! 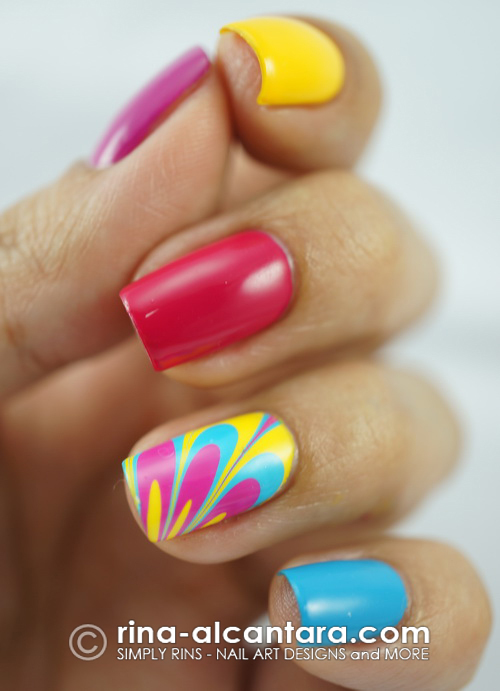 This manicure looks amazing and all the colours are beautiful! OMG AMAZING! I love it. Happy Birthday! What a beautiful birthday gift. the water marbled nail looks like your wearing a sticker or wrap people are going to ask where you bought it! They look wonderful and I'm really surprised by how well the accent marble turned out. Bravo to the people who chose the colours, bravo! Ang lakas makasosyal ng Thakoon!!! `Pak Pak boom!!! What brand of top coat are you using? Fun colors! It's a very happy manicure! Seche Vite and Sally Hansen Insta-Dri are 2 of my favorite top coats. I wish I could afford NARS polishes. They are so very expensive! Beautiful water marble!! You look like you're ready for summer!! :) Nice collection!